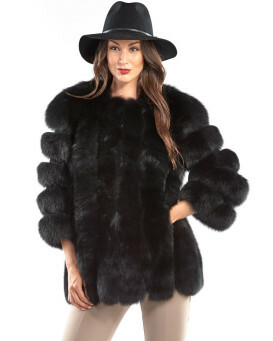 The cropped Sky Black Finn Raccoon Fur Jacket is a look that appears to be taken straight off the Parisian runway and delivered directly to your doorstep. Cutting-edge and bold, the 100 percent raccoon fur jacket is thick and plush, boasting four concealed snap clip fasteners, stain lining and side-entry pockets. Although this is a high fashion fashion piece, the Greta jacket still has all the practicality and comfort needed to be worn out on a trip during the day. Of course, its bold simplicity also makes it the perfect choice to add a splash of modern fashion to an evening ensemble at a winter dinner party. The center back measures 21 inches long and this jacket can be purchased in women's sizes small through large. 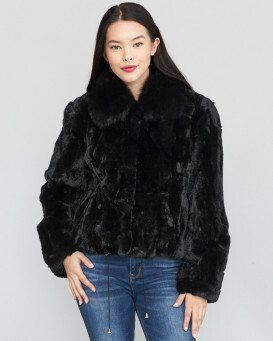 Whether you are petite or curvy, you can rock the sharp and demanding style of the Greta Black Finn Raccoon Fur Jacket this season and leave everyone asking where they can get their own. 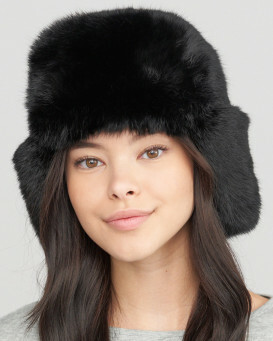 "I was hesitant I never bought a fur coat but it fit PERFECTLY! Very beautiful fit nice size style and texture and shipping was very fast"